Cauliflower is the base for this amazingly wonderful, smooth and cheesy sauce. I know, it’s just what you’ve been looking for. Its a great transition recipe to help you cut back on dairy and a fabulous way to add in more veggies without even knowing it. 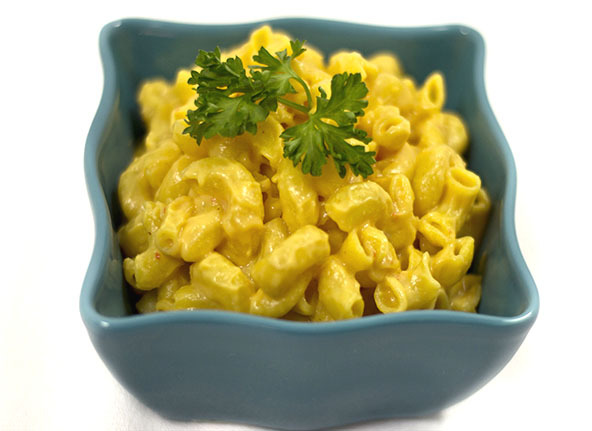 This cheese sauce makes a great mac and cheese dish, nachos, a topping for steamed veggies, omelettes and anything you would normally put cheese on. I used whole grain quinoa and corn pasta for the mac and cheese dish pictured above. We actually prefer the whole grain brown rice pasta but I couldn’t easily find it in the macaroni noodle shape. I also have a non-dairy Vegan and Raw version you might enjoy as well whenever you’re ready. Chop the cauliflower in about ½" pieces and add to a pot with a vegetable steamer. Add water to the pot but not enough for it to come over the vegetable steamer. Cook on high heat for 6 or 7 minutes until the cauliflower is soft enough to blend. Add all of the ingredients into a high powered blender. If it is too thick for your needs, add more wMilk of choice. If needed, heat up in a saucepan to melt the cheese. It should be warm from the steamed cauliflower so you can simply pour over steamed vegetables or hot Gluten-Free pasta, chips etc.